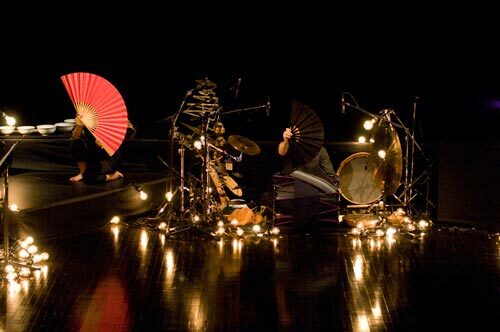 Inspired by Makura no sōshi(The Pillow Book) by Lady Sei Shōnagon (Japan, around the year 1000), this show offers a real interaction between music, dance and poetry. Composition and improvisation are brought together to create original music influenced by Japanese aesthetics. Through different approaches - electronic, electric and acoustic - contemporary choreography and poetry alternate, intercalate and blend to create a unique three-dimensional production. Under the artistic direction of Claire Gignac, the creative team is composed of Patrick Graham, multi-percussionist and a faithful collaborator of La Nef (team member of the Musiques des Montagnes, Déserts, La Traverse miraculeuse etc. and musical co-director of Skin, a percussion blitz! ), Jean René, viola and guitar, a musician proficient in various musical styles and a highly skilled improviser, Frédéric Auger, sound design and real-time sound processing, and Louis-Xavier Gagnon-Lebrun, lighting design. In addition, the young choreographer and dancer Tomomi Morimoto joins La Nef for the creation of a pluridisciplinary show. The body language of Tomomi Morimoto is complex and impregnated with various influences ranging from traditional Japanese dance to the occidental avant-garde of the 20th century. Claire Gignac: artistic direction, flutes, dizi (Chinese bamboo flute), bowed psalteries soprano, tenor and bass, voice.